Bear Bear the Fearsome Rottie: Fined $9000 for Dog Attack / Farewell to Mono! THE man whose mongrel bit three children in January was fined $9,000 on three charges on Thursday. 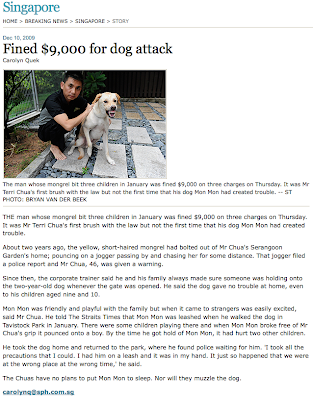 It was Mr Terri Chua's first brush with the law but not the first time that his dog Mon Mon had created trouble. 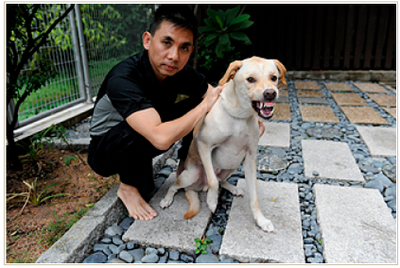 About two years ago, the yellow, short-haired mongrel had bolted out of Mr Chua's Serangoon Garden's home; pouncing on a jogger passing by and chasing her for some distance. That jogger filed a police report and Mr Chua, 46, was given a warning. Since then, the corporate trainer said he and his family always made sure someone was holding onto the two-year-old dog whenever the gate was opened. He said the dog gave no trouble at home, even to his children aged nine and 10. Mon Mon was friendly and playful with the family but when it came to strangers was easily excited, said Mr Chua. 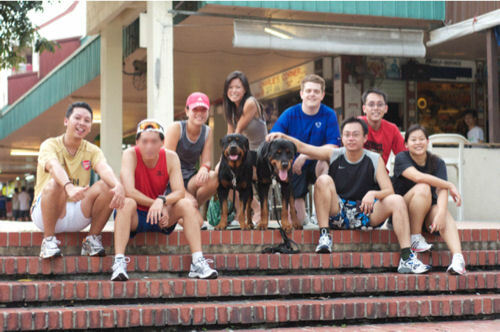 He told The Straits Times that Mon Mon was leashed when he walked the dog in Tavistock Park in January. There were some children playing there and when Mon Mon broke free of Mr Chua's grip it pounced onto a boy. By the time he got hold of Mon Mon, it had hurt two other children. He took the dog home and returned to the park, where he found police waiting for him. 'I took all the precautions that I could. I had him on a leash and it was in my hand. It just so happened that we were at the wrong place at the wrong time,' he said. The Chuas have no plans to put Mon Mon to sleep. Nor will they muzzle the dog. What is wrong with people nowadays? While a dog has every right to live and protect his family, so does other human beings as well. This dog is obviously out of control. Owners like these are utterly clueless what to do. This is so terrible. Uncle Jaywalk had a very nice article up on his blog for us... go take a look! 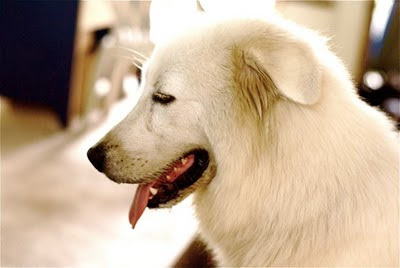 Good news for Mono the Pyrenean Mountain Dog. His owner was looking for him eventually and is actually our neighbour. The worst thing is that Pa actually brought the dog to that farm and asked the people there is that dog theirs... and they said no it wasn't. Sounds like they might be having some internal issues with each other... I do hope Mono will not be suffering for it. Good Luck Mono! we will be visiting you soon.